The Little Theatre, University of Adelaide, Thu 10 May. Despite the reference to Nazi Germany in this play’s rather long title Myth, Propaganda And Disaster In Nazi Germany And Contemporary America is principally about America. More scarily perhaps is the fact that it could just easily be about Australia. Despite the domineering presence of the stars and stripes across the back of the stage I felt like I was witnessing a self-examination of my own culture. Richard Flanagan’s recent landmark address to the National Press Club touches on similar terrain with his suggestion that Australia is constructing a national identity based on falsehoods and deception. The University of Adelaide Theatre Guild’s latest offering was written in the aftermath of 9/11. Australian author Stephen Sewell asks his audience to consider whether his Kafkaesque vision of contemporary America might have somehow caused the cataclysmic event, and that its paranoid overreaction was both self-fulfilling and predictable. Is the play still relevant 15 years on? Sadly, even more so. Needless to say Myth is not a light night out. It is crammed full of ideas about national identity, values, culture, war, the lessons of history, terrorism and police states. And for the most part it presents these ideas without getting too bogged down. Having the play broken up into short scenes (30 of them) keeps things moving along, and only when things start to become somewhat extreme – and test your faith in the civilization of your own culture – does it tend to drag a little. This is not helped by a tendency for much of the interaction to become loud and monotone in the second part of the play. There are others ways to express anger and indignation other than raising your voice. However, the cast delivers even, strong performances. Nick Fagan has to get special mention for his portrayal of the incredibly demanding role of Talbot – he does a really good job of it. Enjoyed isn’t quite the word for it, but Steve Marvanek was suitably threatening as ‘The Man’ and managed to inject an element of dark humour into the role of intelligence officer/tormentor. Tim Edhouse was also utterly convincing as the smarmy, spineless university department head. The split level stage set effectively separated the social and working lives of the characters, and offered relief changes of focus in a relatively long play. But it is definitely worth seeing. It is still sadly relevant to both American and Australian cultures, and indeed any culture grappling with its response to the new forms of terrorism. Sewell reminds us that Germany’s slide into fascism had some characteristics that may be becoming features of our own world, and that we’d be well advised to take heed. 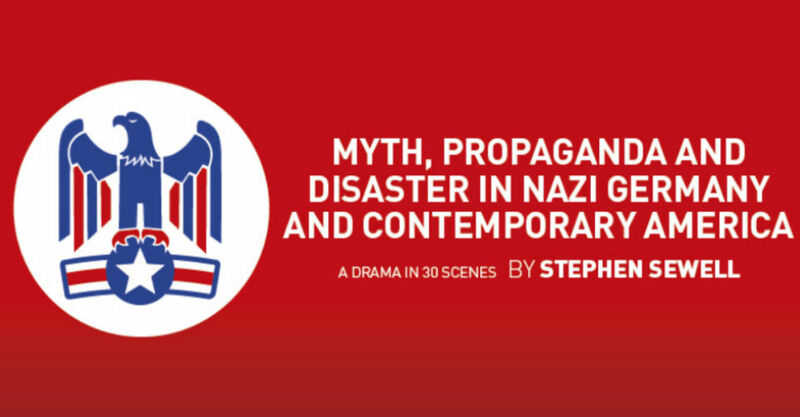 Myth, Propaganda And Disaster In Nazi Germany And Contemporary America continues at The Little Theatre, University of Adelaide, from 7.30pm, until Sat 19 May. The Little Theatre, University of Adelaide, Thu 10 May. Despite the reference to Nazi Germany in this play’s rather long title Myth, Propaganda And Disaster In Nazi Germany And Contemporary America is principally about America. More scarily perhaps is the fact that it could just easily be about Australia. Despite the domineering presence of the stars and stripes across the back of the stage I felt like I was witnessing a self-examination of my own culture. Richard Flanagan’s recent landmark address to the National Press Club touches on similar terrain with his suggestion that Australia is constructing a national identity based on falsehoods and deception. The University of Adelaide Theatre Guild’s latest offering was written in the aftermath of 9/11. Australian author Stephen Sewell asks his audience to consider whether his Kafkaesque vision of contemporary America might have somehow caused the cataclysmic event, and that its paranoid overreaction was both self-fulfilling and predictable. Is the play still relevant 15 years on? Sadly, even more so. Needless to say Myth is not a light night out. It is crammed full of ideas about national identity, values, culture, war, the lessons of history, terrorism and police states. And for the most part it presents these ideas without getting too bogged down. Having the play broken up into short scenes (30 of them) keeps things moving along, and only when things start to become somewhat extreme – and test your faith in the civilization of your own culture - does it tend to drag a little. This is not helped by a tendency for much of the interaction to become loud and monotone in the second part of the play. There are others ways to express anger and indignation other than raising your voice. However, the cast delivers even, strong performances. Nick Fagan has to get special mention for his portrayal of the incredibly demanding role of Talbot – he does a really good job of it. Enjoyed isn’t quite the word for it, but Steve Marvanek was suitably threatening as ‘The Man’ and managed to inject an element of dark humour into the role of intelligence officer/tormentor. Tim Edhouse was also utterly convincing as the smarmy, spineless university department head. The split level stage set effectively separated the social and working lives of the characters, and offered relief changes of focus in a relatively long play. But it is definitely worth seeing. It is still sadly relevant to both American and Australian cultures, and indeed any culture grappling with its response to the new forms of terrorism. Sewell reminds us that Germany’s slide into fascism had some characteristics that may be becoming features of our own world, and that we’d be well advised to take heed. 3.5 stars Michael Coghlan Myth, Propaganda And Disaster In Nazi Germany And Contemporary America continues at The Little Theatre, University of Adelaide, from 7.30pm, until Sat 19 May. Book at trybooking.com. Click HERE to purchase your tickets.